Babies! How is that they are so small but need so many things?! Breastfeeding supplies, bottles, swaddles, swings, carseats, strollers... yeah, it can get a little overwhelming to think about, can't it? If you've been pregnant before, you know that creating a baby registry is not as easy and quick as one would think. If you haven't been pregnant before, let me just tell you: it's no joke! Especially if you're like me and never really spent all that much time in baby stores (other than buying gifts for others) prior to becoming pregnant...I was like a lost little puppy when I walked in Babies "R" Us and I remember feeling so stressed because I had no idea what the best products were, and what I really needed on our registry. And my husband? Sorry Billy, but not exactly a baby product expert. We decided to register at Babies "R" Us with Camden and luckily, since I wasn't afraid to ask some questions, we had an excellent experience registering with them! We actually split up registering into multiple visits and each time we had the most helpful employees (what they call their Personal Registry Partners) showing us where certain products were located in the store, teaching me how to add/remove things on my registry when scanning, and recommending popular items and products that other mom's love. Still, to this day, I prefer shopping at Babies "R" Us when I need anything for Cam because they always have what I need and are so helpful. And when using the registry online, they make it super easy to add and delete things! For those of you who might need to register soon, I highly recommend Babies "R" Us. Especially if you're into having less headaches. :) They are having a Registry Party on January 16th from 11am-12pm in all Babies "R" Us stores! They will have games, giveaways, and a meet & greet with other parents-to-be (great way to meet new friends!) Also, be sure to download their new Registry App so that when you think of a product you want to add but you're on the go and not at home (happens to me all the time! ), you can easily add to it! You can also share with family and friends this way! 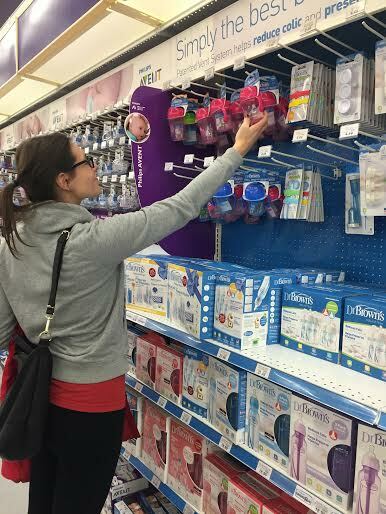 What is your favorite thing about shopping at Babies R Us (or if you've registered with them, what did you appreciate the most?) Tell me in the comments for a chance to win a $100 Babies R Us Gift Card! This sweepstakes runs from 1/13/16 – 2/11/16. Be sure to visit the Babies”R”Us brand page on BlogHer.com where you can read other bloggers’ posts! I love that they price match to other stores! I love that they accept competitor coupons. I also registered at BRU with my first and enjoyed my experience. Thank you for the heads up on the party at each store, my sister is pregnant and registered there and would enjoy the party. 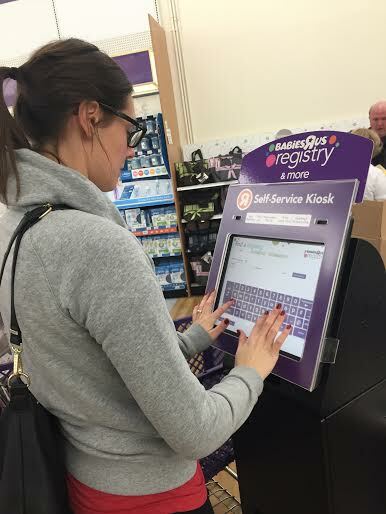 I loved being able to shop and update the registry online! I love the variety and being able to shop online and in the store! I love the variety and abundance of items they have...it is literally a "one-stop shop" for baby items! We love Babies R Us! There is always a huge variety of quality clothing and supplies for baby and me! I love that you can use competitors coupons and that they are always willing to help when you ask. I loved being able to update the registry online and the completion coupon they sent at the end. My favorite thing was that I was able to find everything I would ever need right there in one place! They have it ALL! I love that BRU always has what I'm looking for, and that you earn points/money back on purchases. It's my fave baby place to shop! I love the price match! I feel like the store is super easy to navigate and everyone is always helpful, especially when registering since its so overwhelming! I like that you can go in person and see all the different items compared to just shopping online. I registered there for my now 12 month old daughter. I loved that after 6 months of using a sound machine I registered for there they let me exchange it for a new one- no questions asked! I also love the huge selection of organic pouches at my local babies r us. My favorite thing about shopping at Babies R Us is that they price match. They have a nice selection of adorable preemie outfits (we've had a lot of twins born in our circle of friends in the last few years). I love to shop at Babies R Us because the staff is always so helpful and knowledgeable. I like that they offer pick up in store! I love how organized the store is and how they have absolutely everything you would need! Everytime I shop there I get lots of good advice on baby gear. I've had some of the best employees helping me choose the best items. My favorite thing about shopping at Babies"R"US is they have a wide variety of items. I can always find new things that I hadn't even thought of that will be helpful for my family. I love their wide selection of items and mostly free shipping! My favorite thing about Babies R Us is... Well there are a few the first would be the wide variety they have! The store in my hometown is always so organized so that you can actually find what you are looking for! Lastly PRICE MATCHING!!!!!! My favorite thing about shopping there is that you can try out the gear in person. I love the different selections of options they have available. I like Babies R Us giving back money in the form of a gift card for items that I purchase from the baby registry, and I like the return policy and that they have so many wonderful items to choose from! I love shopping there because they have everything I need. They also carry cloth diapers. I love how clean and organized the Babies R Us store is as well as how many products and items they carry. My favorite things about shopping at Babies R Us is they price match other competitors & they also honor competitor's coupons. They also have a great variety! I love the large variety of items they have; there's something for every type of parent and baby! I like getting swings and bouncers at Babies R Us, they have great selection to choose from. My favorite thing is that there are so many options there. I am registered there and the help we received from the registry specialist as well as the gentleman in the stroller section was second to none!!! I love their selection of baby items and the helpful staff! My store has really great and easy returns. I know this isn't the case for all Babies-R-Us stores, but for me it was a breeze. I like that they have everything I need at one place and the prices are really good. Thanks so much. I just registered there on Monday and they were so friendly and helpful! Thank you so much for telling us about the app! I didn't know they had one! I like that there are things for babies and for my toddler and kindergarten age children, too! I loved being able to create my registry online since we don't have a BRU in my area. I love that they've improved their app because it was very "user unfriendly" in the past! i like the huge selection and the offer coupons. There is a Babies R Us right near my house and I like that they have a huge selection, it's just overwhelming! I love how knowledgable the staff at my babies r us was. When we were registering for our son (first time mom) we had no clue what we were doing. The manager that helped us was so nice!! I love being able to place something from a friends' registry on hold online and then it being ready for pickup at the store! My favorite thing about Babies R Us is that they have items in all price ranges. It makes it easy for friends and family to find a gift for you within their budgets. My favorite thing about shopping at Babies R Us is that they have such a wide variety of items that there is no need to shop elsewhere. I love that I can get my shopping done in one shopping trip. I love their selection! They have so many more items than anywhere else I've been. I love being able to create my registry online, and they have such a large inventory of items. My favorite thing about shopping there is that they have everything all in one place! I like shopping for baby shower gifts at Babies R Us so I can get what the new mom wants and needs without duplicating a gift. There is nothing more joyful than shopping for new babies! Babies R Us makes it such a joy. My favorite thing about shopping at Babies R Us is that you can find every thing you need in one store. I like having a baby swing for my babies. Also diapers and wipes are always great gifts! My favorite part about shopping there is the huge selection. I just bought the most adorable baby present there for a baby shower. I like that their prices are lower than a lot of baby stores. The thing that I like the most and have registered on the registry is the Fuzion Infant Car Seat. I've got to declare the top element with regards to searching in Children 3rd there’s r People can be precisely how well-organized your keep can be along with precisely how valuable his or her personnel are actually time and again!